Democratic presidential frontrunner Hillary Clinton will hand over her private email server, she used while serving as secretary of state, to the United States justice department to cooperate with the government's security inquiry. "She directed her team to give her email server that was used during her tenure as the secretary to the department of justice, as well as a thumb drive containing copies of her emails already provided to the state department," her campaign spokesman Nick Merrill said on Tuesday. "She pledged to cooperate with the government's security inquiry, and if there are more questions, we will continue to address them," he said. This past spring, the spokesman said, Clinton asked the department of state to publish the 55,000 pages of the work emails she provided last fall. As she has said, it is her hope that the State and the other agencies involved in the review process will sort out as quickly as possible which emails are appropriate to release to the public, and that the release will be as timely and transparent as possible, he said. "In the meantime, her team has worked with the state department to ensure her emails are stored in a safe and secure manne," Merrill said. Meanwhile, State Department spokesman John Kirby said the intelligence community has recommended that portions of two of the four emails identified by the intelligence community’s inspector general should be upgraded to the top secret level. "The department employees circulated these emails on unclassified systems in 2009 and 2011 and ultimately some were forwarded to Secretary Clinton. They were not marked as classified," he said. "These emails have not been released to the public. While we work with the director of national intelligence to resolve whether, in fact, this material is actually classified, we are taking steps to ensure the information is protected and stored appropriately," Kirby said. Indian-American Republican presidential candidate Bobby Jindal, in Iowa city on Tuesday evening, said Clinton should be held to the same standards as members of the military and intelligence community who would be subject to potential jail time for handling top-secret information on a personal server. "When you were serving... if you had been this reckless with classified information and our nation's secrets, what would've happened to you? Do you think you would've gotten a promotion," Jindal asked. "Do you think you would've said 'what difference does it make?' Well no. And here Hillary Clinton wants to be our commander-in-chief. I don't know about you, but I think that the general and the private should follow the same rules and the same laws," he added. The Republican party leadership, meanwhile, questioned Clinton's decision to handover her private email server to the justice department. "If Hillary Clinton believed in honesty and transparency, she would have turned over her secret server months ago to an independent arbiter, not as a last resort and to the Obama justice department," said Republican National Committee chairman Reince Priebus. 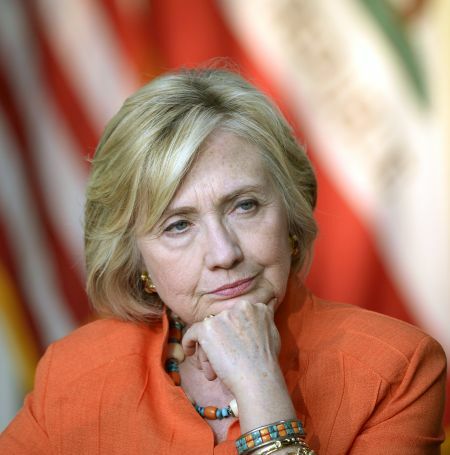 "Of course, if she really cares about transparency, she would never have had a secret server in the first place. All this means is that Hillary Clinton, in the face of FBI scrutiny, has decided she has run out of options. She knows she did something wrong and has run out of ways to cover it up," Priebus said. House of Representatives Speaker John Boehner demanded that Clinton's mishandling of classified information must be fully investigated. "It is about time. Secretary Clinton's previous statements that she possessed no classified information were patently untrue. Her mishandling of classified information must be fully investigated," Boehner said.